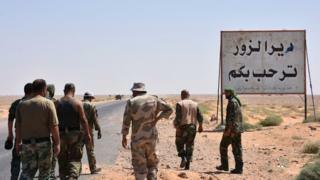 Image caption Syrian government forces were pictured standing beside a sign saying "Welcome to Deir al-Zour"
Syrian government forces are closing in on the eastern city of Deir al-Zour, which has been besieged by so-called Islamic State for almost three years. A rapid advance had brought troops to within 3km (2 miles) of the government-held enclave on the western bank of the River Euphrates, state TV said. Meanwhile, two Russian soldiers were killed in an IS mortar attack in Deir al-Zour province, Moscow said. Until Monday, Russia had put its military casualties in Syria at 34. However, media reports - based on interviews with relatives and friends of some those killed in Syria - have suggested that Russia has been underplaying its military losses during its nearly two-year military campaign in Syria. The Syrian troops are also reported to have reached the edge of the government-held Brigade 137 military base, close to Deir al-Zour. IS controls half of Deir al-Zour and much of its surrounding province. It is the jihadist group's last major stronghold in Syria, with the de facto capital of Raqqa under siege by a US-backed alliance of Syrian Kurdish and Arab fighters. An estimated 93,000 civilians are living in the government enclave in Deir al-Zour. They have been dependent on supply flights by the Syrian military and air drops of aid by the United Nations, who last month said conditions were "extremely difficult". The official Sana news agency cited provincial governor Mohammed Ibrahim Samra as saying that residents had celebrated on the streets on Sunday evening after learning that soldiers and pro-government militiamen were close. "They are filled with joy waiting to welcome the heroes of the army, who are going to break the siege," he said. The military media unit run by Lebanon's Hezbollah movement, whose fighters have played a key role in the advance towards Deir al-Zour, broadcast what it said was video footage of the celebrations. It also reported that pro-government forces had taken control of hills in the city's western countryside and cut off IS supply routes on Sunday. The Syrian Observatory for Human Rights, a UK-based monitoring group, later said that soldiers and militiamen had reached the edge of the Brigade 137 base and were battling militants inside. "If the regime soldiers succeed, they will have broken the siege on the base and the neighbouring Deir al-Zour district of al-Jura," he told AFP news agency. On Monday afternoon, the Hezbollah media unit and Syrian state television confirmed that troops were battling militants outside Brigade 137 and were only 3km away from breaking the siege of the city.